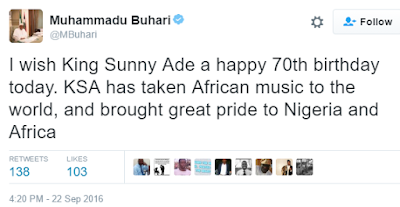 "President Muhammadu Buhari warmly congratulates music legend, King Sunny Ade, as he turns 70 onSeptember 22nd, 2016. President Buhari joins all friends, family and fans of the multi-talented instrumentalist, songwriter and dancer in celebrating his remarkable life, which has been graced with numerous awards for outstanding performances, including nominations for the Grammy." "As a Nigerian musician, the President believes the Septuagenarian has over the years brought pride to his country by mastering his art against all odds, taking the African musical genre to the global stage, and serving as an inspiration and a mentor to upcoming artistes." "Apart from bringing joy to many hearts and homes through his music, President Buhari also commends King Sunny Ade’s love for humanity, especially the less privileged, by setting up a foundation that caters for the needs of others." "He prays that the almighty God will grant the versatile entertainer longer life, good health and more strength."